Degree: Mass Communications, B.A., Sociology, B.A. Melanie has been racing bikes in Northern California for the last 5 years and has been an athlete her whole life, growing up as a competitive gymnast, swimmer and diver. Shortly after college she was introduced to the sport of cycling and rose quickly through the ranks. She excels at road courses with short, punchy climbs as well as technical criteriums. Her favorite thing about cycling is the mechanics behind team strategy and “the game” behind every race. When not on the bike, Melanie is a program manager at LinkedIn in Silicon Valley where - very much like a team sport - she organizes software engineers to collaborate, communicate and execute. She believes that athletes make the best employees and enjoys how one passion feeds the other. 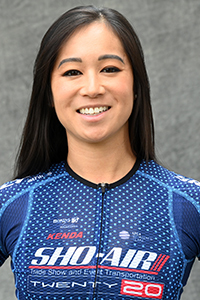 As a new member to TWENTY20, her goals this year are to be active in the peloton, effectively communicate and be someone teammates can consistently count on to make meaningful contributions to team wins. I was inspired to race bikes for a very simple reason – my boyfriend at the time told me not to. He introduced me to the sport and helped me buy my very first bike. I’ve grew up as an athlete, so mastering a new skill was really exciting to me and I was endlessly fascinated by team strategy while watching the Tour de France. However, when I hinted that I was thinking about racing, I was met with disdain – “I don’t want you in my sport. This is my thing.” Challenge accepted. Several months later we broke up and I won my first bike race. One of the most inspiring figures in my life was my grandmother, Mabel Wong. She was the center of our family with an engaging personality, tell-it-like-it-is attitude and wicked sense of humor. During WWII she owned and operated a corner store and soda fountain where she employed and mentored local girls, encouraging them to make take chances, try new things and expand their horizons. In her senior years she was an active member of a large number of charities and traveled all over the world, making friends everywhere along the way. She would always tell me “work hard, be humble, keep an open mind” – lessons that I live by every day. My favorite meal when training is scrambled eggs with garlic-cilantro rice, topped with pea shoots and avocado. It’s simple to make, easy on the stomach and is perfect at any time of the day. The best thing about being a bike racer is getting to meet and stay with host families across the globe. All these generous folks are from different walks of life and have completely different ways of relating to the sport, but at the same time share the same enthusiasm for opening their homes to complete strangers. My favorite place to race so far has been Tulsa, Oklahoma. The city has a little bit of something for everyone – gracefully shaded parks, striking art deco architecture and quirky, colorful neighborhoods. The way in which the community embraces and participates in the bike festivities has a great energy that is truly unique. My favorite off-season activity is kayaking. It’s incredibly peaceful out on the water and a really great way to relieve stress from the week. It’s also a pretty good workout and forces me to use a very different set of muscles. I also enjoy working on jigsaw puzzles. One of the things I try to stress with new bike racers is that “more” does not always equal “better.” Sometimes new riders are under the impression that training for hours or riding for miles and miles will make them faster racers. While this certainly can help improve their base fitness, it doesn’t necessarily mean you are getting the level of focused intensity you need to win races and can be detrimental if they are not balancing their riding with periods of rest. What are one or two things that you do daily that are key to your success? I have a really challenging schedule between working in Silicon Valley, commuting and training, so I rely upon a strong set of rituals to fit everything into my day. The first is that I get up every morning and fix my bed. While this may seem like an unimportant chore, having the discipline to pay attention to the details puts you in the right mindset to tackle the rest of your day and gives you a sense of accomplishment right out of bed. Second, before going to sleep I do everything possible to prepare for my workout the next morning. I make my bottles and food, lay out my kit, pump my tires, charge my lights, put on my fenders – anything that will take precious minutes away from me getting out the door and on my bike as soon as possible. If I weren’t bike racing I would open my own catering and event planning business. I love to cook and enjoy planning meals and parties for my friends and teammates. If I could spend 10 days anywhere it would be in Mallorca, Spain – otherwise known as “Disneyland for bikes.” It has picturesque climbs with endless miles of butter-smooth pavement, friendly locals, very considerate drivers (I’ve never been honked at or buzzed by a car), delicious food options and cyclists everywhere. I also grew up as a musician, singing, playing piano and arranging music. In college I was a member of a pop a cappella group at UCLA.